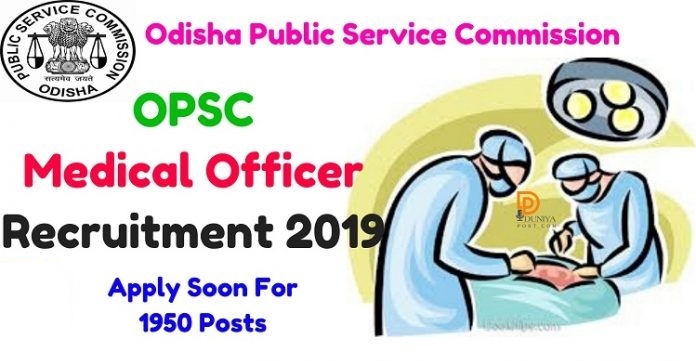 OPSC Medical Officer Recruitment 2019 – The Odisha Public Service Commission has published a Recruitment notification For OPSC 1950 Homeopathic MO Vacancy 2019. This is a great opportunity for the applicants who are searching for Govt Jobs in Odisha. Candidates who are interested in these posts can check all the details here. The application process for this OPSC MO Recruitment 2019 through online mode. As per the notification, the starting date from 10 January 2019 and the last date to fill up an online application form is 31 January 2019. More details about OPSC Medical Officer Recruitment 2019 including number of vacancies, Notification Date, Eligibility Criteria, Exam Date, Application Form, Exam Pattern, Admit Card, Result, and all other queries given below…..
OPSC चिकित्सा अधिकारी भर्ती 2019 के बारे में अधिक जानकारी, रिक्तियों की संख्या, अधिसूचना दिनांक, योग्यता मानदंड, परीक्षा तिथि, आवेदन पत्र, परीक्षा पैटर्न, प्रवेश पत्र, परिणाम, और अन्य प्रश्नों के के लिए पूरा आर्टिकल पढ़ें…..
M.B.B.S. or equivalent Degree from a Medical College or Medical Institution recognized by the Medical Council of India; Must have a valid registration certificate under the Odisha Medical “Registration Rules 1965”; and Possessed required conversion certificates recognized by Medical Council of India (MCI) in case of candidate having Degrees from Universities of Foreign Countries. All the candidates who are applying for OPSC Medical Officer Recruitment 2019 has to under go through Written Exam & Documents Verification. 8 – Take a hard copy of Your filled Application form for future use.